It has been quite a while since I wrote a Books to Inspire post but you cannot get more inspirational than the story behind the Meet Lucy and Jack series. Just over 12 months ago I reviewed a very special book called "H is for Haemodialysis" written for children whose families are affected by kidney disease. It was the debut picture book of Anita and Simon Howell, who had been inspired by their own experiences of dealing with kidney disease and the impact it had upon their own family life raising two young children. Simon himself suffers from kidney failure and receives dialysis. He is currently waiting for a second kidney transplant. Over the last 12 months the husband and wife writing duo, despite receiving the devastating news that Anita has aggressive breast cancer, have managed to publish an additional two books; "P is for Peritoneal Dialysis" and "K is for Kidney Transplant". Both books feature the same characters as the original book, a brother and sister, Lucy and Jack. 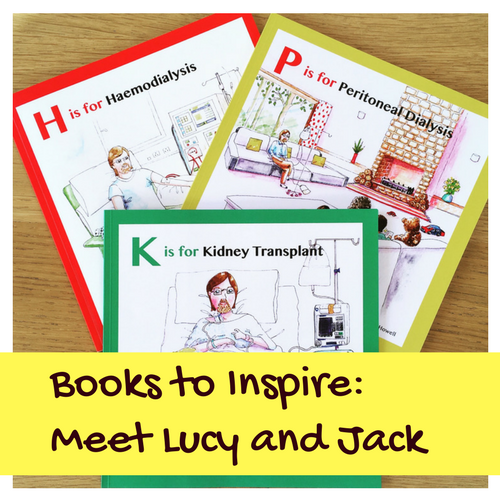 The second book in the Meet Lucy and Jack series takes a look at peritoneal dialysis and the third, explains organ donation and the process of kidney transplant. All the stories are narrated by older sister, Lucy and she explains these difficult medical concepts in a straightforward and child friendly way making the medical information and terminology accessible to the whole family. There is also a helpful glossary at the end of each book. However Meet Lucy and Jack is not simply a factual series about illness and medical treatment, they are stories about a real family. The children go to school, take trips and even go on holiday. The narrative is full of warmth and there are moments of pure delight from Lucy. All three books have been illustrated by Sue Roche and her scenes capturing special moments in the family's life together are particularly beautiful. I can see how the series would offer families such comfort and strength when learning to live with kidney disease. Anita and Simon hope that their books will help other families dealing with kidney failure and I hope that their personal story will inspire others to sign the organ donor register. If you would like more information about this series, please visit Meet Lucy and Jack on Facebook. * I received copies of these books for review purposes, all opinions are my own. Yes I think it is a real skill to be able to convey this type of information to kids honestly and clearly! What an inspiring way to deal with such traumatic circumstances. Thanks for sharing and linking up to #KCACOLS Come back soon. What an amazing thing to do - write about topics that are so important. Thank so much for sharing and for linking up with #KCACOLS. Hope to see you again next time! My niece wants to be a paleontologist. She's five. She'd love this!